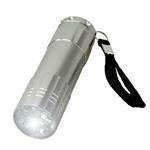 3-in-1 LED keychain light. Has RED laser, Ultraviolet LED light, and White LED light. Includes 3 alkaline button batteries. Push-button operation. Has sturdy mini keychain carabiner. Light is about 2.9" long, 0.5" diameter, and the carabiner is about 1.75" long. The available shell colors are black, silver, green, blue, red, purple. A random color will be selected, unless you specify a desired shell color in the customer notes. Unit price is $ 6.95 each. Picture shows color assortment. To operate: unscrew the back end, remove the first battery, and remove the safety washer. They re-insert the battery. The 3-in-1 LED light is then ready to use!